October 18 – Cody Howard, Director of the Friendship Center and Church Under the Bridge. Cody is assisting us in our Thanksgiving Basket mission this year. He’s extremely in touch with the needs of people in the immediate vicinity of our church. November 15 – A Taste of Sunday Evening. If you haven’t been to FPC on a Sunday evening to refresh your spirit, this will be a special treat. Our Sunday evening music team will lead us in song for the evening. November 29 – Shawn Vaughn, Communications Officer for the Texarkana Texas Police Department. Officer Vaughn will share with us some of the needs and community programs that address those needs. He’ll talk about how churches might walk alongside our police departments to make a positive impact in the community. Officer Vaughn brings a unique community perspective in that he retired from the police force on the Arkansas side and now serves on the Texas side. December 13 – Beverly Coleman, chemotherapy nurse for Dr. Eickler. Beverly is the face-to-face contact for many of the cancer patients who receive Angel Quilts. She’s an amazing and Godly woman who shared an inspiring message recently at the Angel Quilt Luncheon. Come ready to be fired up for ministry by hearing her first-hand experience of how the ministry of Angel Quilts has truly impacted our community. This is just some of the great programming available on Wednesday evenings. 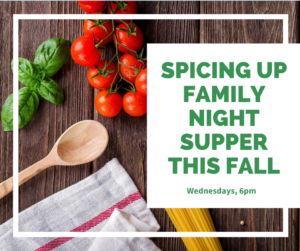 If you haven’t been in a while, or maybe never at all, do yourself a favor and come join the joy of Wednesday Family Night Suppers. Dinner at 6 pm. Program, 6:30 to 7 pm.